7 mi hill and speed Trang on the Mt rd, oh what a great day to still be alive and moving under my own power! 4 easy miles on my rest day before Long Run Sunday. Plus a full body workout (Fb-W/O) at LCAC gym. Left the house this AM for a Nice 13 mile Long run. Just a few minutes out the door and I was insulted with a light sprinkle of freezing rain, I stopped and put on my garbage bag rain wear and continued. By the time I got to the Porter Rockwell Trail it was sprinkling harder mixed with a little bit of snow, I kept on going. Now I'm out 4 miles and it's decided to really start raining and snowing, much harder. I'm on my way back and by the time I get to the Draper Park and the PRT Trail head ( about 3 miles) it has already dropped 3" of snow on me and my gloves are soaked and my fingers are very cold. This all remindes me of running Boston 2018 except the weather conditions today were much better than at Boston. I took a quick stop at the park bathroom and dried out one pair of gloves on the heated hand dryer, geared myself back up and ran the last mile home in 4" of snow on the ground and a blizzard going off all around me! When I got home I decided I'd pick up the remaining 5 mi at another time, I was done for the day! 5 mi on the big block this am, 33*, partly sunny, 84% Humidity, 2 mph wind. 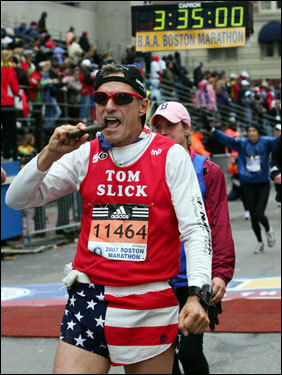 97 days till Boston! 7.5 Hill Training Miles on the big block, Mt Rd, & then home. 6 tempo miles on the Mt Rd. 38*, lite breeze, 93% humidity, 5200' elevation level, mostly cloudy with brief moments of a glimps of sun light. 8 miles (2@MP) today on the big block & the Mt Rd. 40*, 8-10 mph wind, 69% humidity. Winter training in Utah isn't for whimps and neither is getting old while training during the winter in Utah! :) (: 89 days till the Boston Marathon! Anybody else on the FRB running the 123rd Boston Marathon? Speak up! 3 easy rest day miles, FB-w/o.... wet rainy day, yuck! 7 mi (3@MP) on the Big Block. 8 mi hill run, 23*, 9 mph wind, 59% Humidity, total "Gray" day! Best run this training cycle on the way to Boston, so far! 81 days till the Old Man's showdown in Boston, #14 / #60 ! 7 really good miles on the PRT. 33*, lite breeze, lots of sunshine, 56% humidity. 4 easy miles this am, 21*, 67% humidity, 2 mph breeze. Then a Full Body W/O..... 79 days till the Boston 2019 !